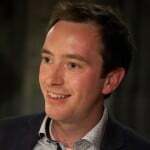 Director of the New Schools Network, Nick Timothy has claimed that new figures “show beyond doubt that we need more new schools- not just to meet demand but to improve quality.” My own analysis suggests that this is not the case. 1. That Ofsted grades are accurate and that an RI or Unsatisfactory school genuinely be RI or Unsatisfactory. We know this is untrue because Professor Coe has shown that lesson observation grades which have played an important role in Ofsted judgements in the past may not be valid. Therefore, children may not be being ‘forced into failing schools’ given that these schools may not in fact be unsatisfactory. 2. Secondly, it assumes that a school which is currently RI or Unsatisfactory will continue to be so. Indeed, it not only seems that ‘satisfactory’ schools been re-labelled ‘requires improvement’, they are also now being treated as ‘beyond hope’. 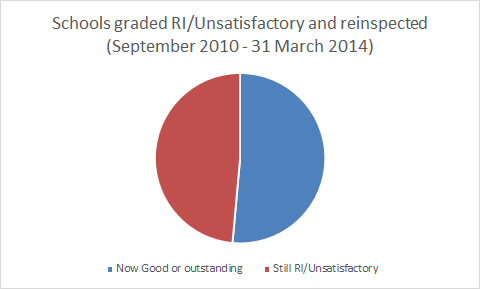 Yet, analysing the outcomes of Ofsted inspections between 1 September 2010 and 31 March 2014 shows that just over half of schools graded RI or unsatisfactory were actually graded good or outstanding when re-inspected. Thus a new place in an RI/unsatisfactory school does not actually mean that pupils will attend a “failing school” in the future. 3. Thirdly, concluding from the data on existing schools that new schools need to be created assumes that the places in new schools will be ‘better’. In fact, we do not currently have enough inspection data to make meaningful comparisons between free schools and other schools. We therefore do not know whether places in new schools really will be better than those in existing schools. The inspections that have taken place certainly make it clear that being a new school is no ‘get out of jail free card’ when it comes to the complex and complicated challenges of running a school. All in all, we cannot confidently say that creating places in new schools rather than currently RI/Unsatisfactory schools is any less likely to result in pupils being “forced into failing schools” in the long run.